irons in the fire . . . Without giving it much thought I’ve always had a number of creative and/or personal projects on the go; attending to what grabs my interest in what spare time I have. In the past week quite a few flagged their presence. 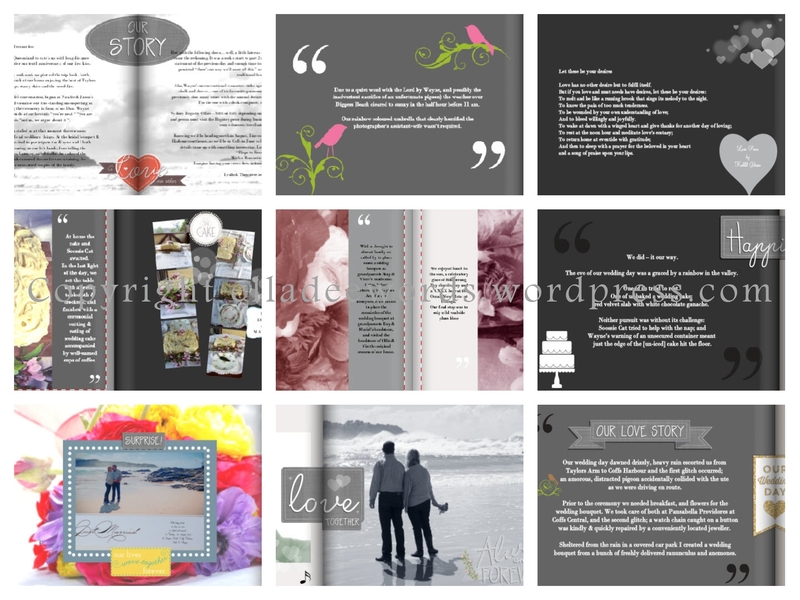 As I read Ardys’ post do your work, then step back… vis-à-vis the genealogy scrapbook she created for her daughter, I thought of the wedding photo book I’d started, and decided to employ similar parameters. I’d gotten as far as importing the photos and placing about two-thirds. I placed the rest of the photos. It looked stark. I decided to flagrantly abandon the parameters. 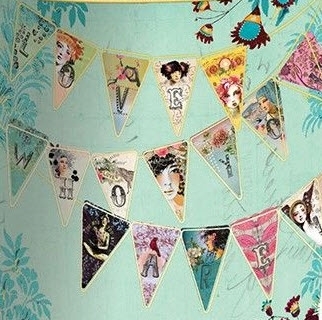 Forsaking restraint, I downloaded wedding theme embellishments, and an eclectic mix of others, splashing them across the pages. My inner Oscar Wilde “Moderation is a fatal thing. Nothing succeeds like excess” was pleased. We’ve purchased an elegant formal album for the 40 printed photos taken by Loving Images Photography. That project, affixing the photos and congratulatory cards within the album belongs to the oh-so-neat-and-patient G.O. Not a task for slapdash EllaDee. There’s method, rather than madness, behind my pick-it-up-put-it-put-it-down style. If I work continually on a project, I stop seeing detail and perspective. I put it aside, park it in the back of my mind and while it’s in hiatus jot down ideas, then return to it afresh. That method also camouflages procrastination… as in the case of our “if you’re reading this, we’re no longer with you” letters. Upon marriage legal wills are revoked, so the day before our nuptials we signed new wills but the accompanying personal wishes + useful information missives could do with refreshing to make them current. Sigh. Late in the week I stumbled across a tangible prompt: a Love Who You Are banner, which complements a project along those lines I’ve been nurturing for too-many-years. My Saturday morning meditation affirmed it should be on my radar and provided insights of how I could develop it further. The same meditation also yielded a suggestion to compile EllaDee’s Photo Library. I use only my own photos in my creative work. I’m pretty good at backing up (more so after the smartphone debacle resulting in the loss of photos of the G.O.’s grandmother’s old house…) particularly now I’m linked to OneDrive, and Google Photos is set to automatically back up my phone. Much like my email and tax filing, it’s all there but there is no order and I regularly search extensively the various repositories. Sigh. Amongst Indie and book club reading and reviews, I read and reviewed Letters for my Little Sister. Elements of Love Who You Are also feed into Celi’s Second Fellowship Book: Letters for my Baby Girl, which I’ve signed up for, and begun composing a letter to contribute. Of course I’ve mislaid my writing- do’s-and-don’ts checklist. Sigh. And there’s the family history, mine or anyone else’s, I explore. I’ve lost count of the strands I’m following. It’s difficult not to get side-tracked. I lose endless time clicking on sources leading to various snippets of information, saving links and excerpts within the labyrinth of my electronic filing for sometime-in-the-future reference. Sigh. However, last weekend we lunched with the G.O.’s visiting aunt & uncle plus family I hadn’t met before who live on the far side of Sydney. We got to chatting about family stories and history, the G.O. enthusiastically sharing the information of their mutual convict ancestry. In a generous weak moment I offered to email the info I’d amassed. Which means locating and sorting it. Sigh. Looking through the files reminded me of a blog post on the third convict ancestor I’d not finished, and old family photos I’d agreed to send to a newly discovered distant cousin from Dad’s mum’s Button family. As she is a prodigious online sharer, I want to watermark them first. Sigh. Blog posts… Sigh. What on earth was I thinking in December 2011 when I created not a single but THREE WordPress blogs? Since sanity prevailed via my April 2014 blog consolidation exercise I’ve barely managed to keep up with one. As well as Pinterest and Instagram, you can also find me on Goodreads and Etsy. “The old proverb about having too many irons in the fire is an abominable old lie. This entry was posted in Blog and tagged Australia, book review, creativity, inspiration, my life, projects. I loved reading about your approach to the wedding album project and your embracing of your inner Oscar Wilde. Should I also add Instagram to my cluttered life? Having added Pininterest last week, my fantasy levels are soaring. You’ve reminded me that maybe I shouldn’t chuckle as I seem to be in the same boat half the time. It sounds as though the advice from, Ardys worked and you stood back a bit before downloading all the embellishments in creation. I bet it looks good now though. I think “shovel, tongs and poker” as well as irons applies to you 🙂 I really did need to consider the “Ardys parameters” before proceeding in my own style. [big smile on my face!] I don’t know how you manage!! Am myself a typical Gemini with a hundred interests which only seem to get finished if the urgency claxon sounds! Even got out of Facebook when two friends [most my ‘real’ friends do not seem to be interested] became some 750 in a year and ended in six foodie groups and a couple defriended me for not ‘caring enough’ an ‘not being there more quickly’! Not true and that actually bothered me!! And, yes, we both work fulltime and I study bigtime and am in a lot of orgs and panels but . . . . and I have my garden there 24/7 and night times are mine and private time!! Perhaps that is everyone’s ‘secret’ ? Have also promised to write for the second Fellowship book: big problems . . .fun and happy occasions are definitely easier to put down on paper than problems and tragedies life may bestow upon one . . . have a restful weekend . . . I feel honoured to be part of The Fellowship that encompasses and welcomes our many and varied experiences. Methinks most of us feel that way about The Fellowship . . . what a magical thing to have happened . . . but I have to admit I still have a lot to learn about life coming first 🙂 ! Hmm, have just paid [two minutes ago] for four courses on ‘Great Courses’ for the ‘quieter’ holiday period!!!!! [laughter] now where on earth shall I fit that one in 🙂 !!! And rather an expensive Yule gift for myself but one in four came ‘free’ . . . but Modern History from the Stuarts thru’ the Vikings thru’ Napoleon . . . . that will be incredible fun!!!!!! You will notice the sub-head on my blog is ‘surrender to yourself’. I love that my post has you thinking and acting, please enjoy your ‘enthusiasms’, as our friend Celia says. Oh Gosh. The on going battle….I have just dragged myself out of bed at 5am on a Saturday morning to try and get to the blogging that I just don’t do anymore because honestly, between schooling my kids and the odd bit of exercise if I am lucky, coupled with intense periods of catch up when Eric is home – where is the time? And there is your post which I just couldn’t resist. Wonderful. Sigh…. I feel more at peace now and anyway, (she says to herself…).reading the posts of your favourite bloggers is an important part of the process! Have fun EllaDee. Thank you 🙂 I spend far more time (often at 5 am-ish) reading blog posts than I do writing them! And get so engrossed my morning walk becomes a very fast morning walk to compensate. But it’s such a wonderful community, we can pop in and out and catch up in an instant. I’ve just done a family history book, with my sister, which I published on Blurb. I was interested to see you have stuff on Etsy…I’ve just been recommended to do the same. I must have a look today. I love that family histories are being shared online. Some of my research is easily done via that forum, and other I have the thrill of the chase, capture… and expense of obtaining birth, marriage & death certificates. It’s something I’ll get into more when I have corresponding availability of time. Currently I’m an Etsy browser/follower/inspiration gleaner but an Etsy “store” is something I’m considering for “one day”. Apparently there are pro’s and cons to be considered for it, Zazzle, etc. Right now not on my agenda but good to be aware of. Thank you 🙂 My “organization” hurts my head sometimes, but possibly not in the way you mean… It’s good enough but I often feel its lack. It’s a fine balance between longer term projects which are somewhat of a creative comfort zone… like always having a book to read, I like to have a fallback project… and more immediate shorter term projects that entertain amongst the stuff of day-to-day life. I write less blog posts, follow less blogs (some via email notification some via Reader) and from time to time comment less… I’m less pedantic than I was and fit it to my time rather than the other way round 🙂 That said, there a core group of bloggers who’s presence I miss when I or they are away… yourself among them. Me too 🙂 Even at work, if a single project consumes my time it feels like it’s consuming me, there’s no stimulus from variation, or sense of fulfilment completing smaller tasks while others take longer.